Note: This topic is for the Pro version of the program only. See here for the Standard version. The context menus appear when you right click on the data grid in the form. There are two context menus. One has the bulk of the data and is shown when you are not in multi-select mode. The other only has two entries. Takes you to the provider page for the earthquake, thus if you have right clicked on a USGS provided earthquake it goes to the page for that event in the new style menus, and of course an EMSC earthquake goes to the EMSC page. Same for GFZ Potsdam. GeoNet I am afraid is a mystery as most of the earthquakes don’t have a page to link to so these and other providers do not go to a web page. Downloads the html file for the event from the USGS web page and formats the phase data into two sets, one in arrival order and the other in station order. These are displayed in a tabbed window. Note not all events have a phase data file. Open the arrival times calculator window and preloads the latitude and longitude and other values. See TauP Arrival Times Interface for more details. That page is a general one that encompasses the stand alone version as well. For a brief period USGS omitted the link to this information from the web site. The links are now back but I have left the code in that I wrote to resolve the problem. Searches for the first 10 stations within 2000km radius from the event and returns a list from which to make a selection. Once you have selected a web page is opened displaying the seismogram. This works for any event in the listings and sends the data fro the event to the IRIS Time Series Plot routine. 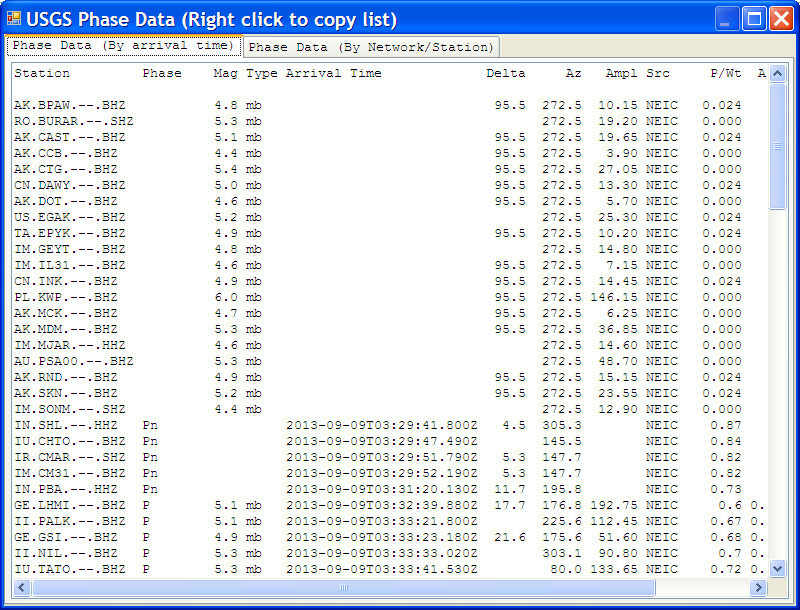 The IRIS Time Series Plot window is loaded with the supplied data, and set to manual entry, and the closest seismograph station is calculated from the real time networks data in the program. The Pro version is changing and many of the functions of ProPlus and SuperPro are being amalgamated to leave one single Pro version. Some of these sub ,emu options may not be available yet, but will be in due course. This provides a formatted output using BB code. It has it's own topic page. More details of this here. This provides a formatted output using HTML code. It has it's own topic page. More details of this here. This provides a formatted output using HTML code that produces the details blocks you can see on the QVS QuakeWatch front page. Sends a temporary post of an event to a blog post by email. This is not available yet as I have not determined the best way to handle it, but it will be coming shortly. There is a working version but it is only good for WordPress blogs. Sends a temporary post of an event to a draft blog post by email. This is not available yet as I have not determined the best way to handle it, but it will be coming shortly. There is a working version but it is only good for WordPress blogs. Details to follow. Working in WordPress but not available in Pro just yet. Click on a line, and then right click the line. You should see this. Make sure you have clicked once on the line first or you will go to the wrong place. (See under deleting a line below this section). I have left the next example even though it shows the old style menu with just Google Earth on it as it is still a useful example. Click on 'View location in Google Earth, or the Tilt View version. Obviously you must have Google Earth installed on your computer to be able to do this! The program shells out to Google Earth and the coloured button is centred on the location. Details of the event are added to the file. When you exit Google Earth you can save this or not as you wish. You may wonder how something can NOT be revised and yet be version 6. You may continue wondering because I have not got any idea! By default the height above the event is 2000 Km, but you can change this in settings if you wish. Don’t forget that this works for quakes that have long since vanished off the USGS data in Google Earth. In fact when I wrote the above I thought it might be good to have a setting for each provider in case things change, so that is what is now available. Displays the location of the earthquake in Google Maps. Seems appropriate really. Places the code that the Google Maps function above uses into the clipboard so that you can paste it somewhere else. You can edit the latitude, longitude, magnitude, magnitude type and depth values for any earthquake in the list. You can now delete a line if you need to. From time to time you may need to do this although generally deletions are best left to the program. Please see the topic on deleting a line here. Does what it says and saved the current configuration of the column widths on the display list screen.